The Man Behind "The Catch"
Chef Bruce Hill at Picco in Larkspur was pretty stoked to have ~Dwight Clark~—the former 49ers wide receiver—in for dinner. And he got quite the souvenir! 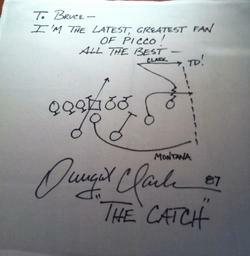 Like, wow, a signed diagram of “The Catch”—Christmas came early!